For someone who claims to love young adult literature, or YA lit, I haven’t been reading a lot of them. So far this year, I’ve finished only two and that’s Keeping The Distance by Clarisse David and What About Today by Dawn Lanuza. Those two led me back to pining for YA novels, and as I looked, my longing grew stonger. As if the YA lit heavens were watching over me, I had the chance to become part of Stay Bookish, a magazine for YA readers led by Hazel Ureta of Stay Bookish, which practically had me panting for all the new (and foreign) YA releases. But it was not until I returned to Net Galley—after around three years of neglect—that I started getting serious about reading YA again. If you’re not familiar with this website, it provides advance reading copies in digital form upon request. This was how I got Zenn Diagram by Wendy Brant, which I first encountered on the SB mag. While I did not exactly love doing math as a student, I like looking at equations, graphs and diagrams, and enjoy trying to solve mysteries. When I saw that the cover implied those + wordplay, well, then = yes to the power of 100. Onto the characters, they are easy to like and relate to. I found the cast pretty special and diverse, and I picked up on the author’s best interest to bend some stereotypes such as on geniuses, artists, athletes, pastors, Christian families, big families, adoptive parents, troubled parents and the perfect all-American teen couple, among others. Eva and Zenn’s voices stand out, and I appreciate how they are represented as funny, sarcastic, insightful, spiteful, hopeful and reckless all at the same time—multidimensional just like real people. I may not have squealed over them that much, but looking back, their romance is just right, perfectly paced to stay attuned with the rest that was going on in the story. Speaking of the book as a whole, I enjoyed how engaging it is enough to make me have read it to the end in one sitting. It explores a lot of universal issues that both YA and adults can mull over and make sense of. But that’s not the catch here. The catch lies in the twist. I don’t want to spoil it for anybody, but let me just say that when I got to it, it felt like I had just uncovered one of the greatest math secrets in the world, and everything fell into place. That, to me, is a brilliant way to use them math-apors. Some parts were predictable and there were a few things here and there that made me flinch a little, although they are nothing unbearable. There also remained a few issues that went unresolved, and I felt like the author could have extended the story to address these instead of relying on an epilogue to sew everything together. Thank you for reading and reviewing! 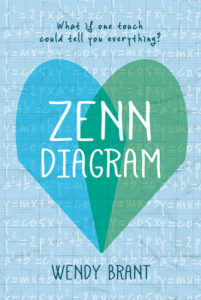 I’m glad you enjoyed Zenn Diagram! Thank you for reading our review! Congratulations on your book.